The 7485E-R is compatible with all domestic brand kegs. This coupler works with all American "D" system sankey kegs. 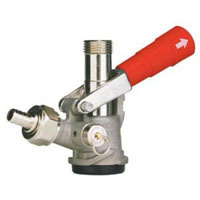 This coupler features a 55-psi pressure relief valve and a nickel-plated forged brass body. To tap a keg all you have to do is pull out and then down on the lever handle to properly couple the keg. Comments: I just used this tap to change my kegerator from a single tap to a double tap (2 - 5 gal kegs). I originally built my kegerator about 8 years ago. This tap is a much higher quality than the one that came with the original start up "deluxe" kegerator kit. This tap works great, looks great, and is a high quality unit.